Every now and then I’ll pick up a classic game from twenty years ago and be really blown away. “Wow,” I’ll think. “Does anyone else know about this? I’ve got to tell everyone!” I’m a little slow on the uptake. Castlevania: Symphony of the Night is one such game. It was one of the first games I ever downloaded, along with Bioshock and Dead Space. I was doing a lot of catching up after forgoing my video game habit for several years and the PlayStation Store was a real treasure trove. I’d never have to the leave the house again! I could just download a dozen or so games from all across the years and be covered. I remembered that Symphony was my high school friend Mitch’s favorite game, so I figured I’d give it a try. It didn’t completely captivate me the first time I played it, but it really clicked for me once I downloaded it to my Vita. My handheld gaming habits tend to be a little more erratic than my console gaming ones. I tend to play in short bursts on my Vita or 2DS, rather than stretches of an hour or more. If I have fifteen or twenty minutes before I have to leave to go somewhere, that’s just enough time to knock out a few levels of a Mario game or something comparable. In Symphony’s case that’s just enough time to go through the Library twice before you remember you need to be in the Keep. Live and learn. The pixel art is to die for. Alucard rules. Dracula oozes personality, even with an extremely simple animation of him throwing a glass down and shattering it. I love the RPG-lite stuff, I love the fast traveling. I love the inverted castle (spoilers, I guess?) that doesn’t show up until you think you’re nearly done. I love that there’s a skeleton that throws barrels like Donkey Kong. It’s a gorgeous-looking game. I don’t usually gush over visuals but everything about the art direction in this game is stunning. The way Alucard moves and attacks, the flowing cape, the fact that you can equip a transparent cape and see backgrounds through it... Incredible. Everything is lush and gothic and vibrant. I thought Bloodborne was super beautiful (everyone should read this essay! I didn’t write it but I agree with it wholeheartedly) and the art direction of this game was definitely a precursor. I didn’t finish the game the first time around but I think I’ll stick with it this summer. It’s a nice counterpoint to Persona 3 and it isn’t too difficult. In fact it’s easier than I remember, a far cry from earlier Castlevania games. The relatively freeform structure of the game allows the player to cruise around as many rooms as they please until they run into something that moves the plot forward. I hit most boss encounters pretty over-leveled but the game is still fun to play. The relative ease of the game even kind of works story-wise; Alucard is the son of Dracula, it’s only natural that he would blow through so many skeleton minions (though it does make any deaths that happen feel way more embarrassing). The game was also a bold experiment in sticking with your guns. It came out in 1997, a time when everyone was all about big chunky polygons. 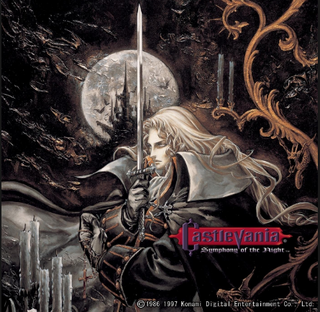 Symphony of the Night stood out the year it was released because it’s a throwback to a much simpler art style but still incorporated new technology. These days I think that indie developers and even some of the big names have taken this lesson to heart, but at the time it was definitely a bold move. I’m digging this game. The voice acting is incredibly cheesy but it’s endearing. The whole package is a feast, and I’m hugely enjoying sampling what it has to offer in a leisurely way.